Today was the day…the day us games designers have all been waiting for and that is Platform Expos in Hull. That quotation included everything we fully intended to do just in day one never mind again tomorrow it was going to be epic. Before the event had event come around I and 2 other students (Phil Maclennan and David Smith click to see there blogs) had already done our research on the event and planned out our Day 1 so that we got the most of this day that would benefit us as Games Design students a lot. The schedule was 10-11 Character Drawing workshop (which we enjoyed and turned into 10-12), 12.30-1 Industry Speaker- Developing for Microsoft, 1-1.40 Running a game studio for Microsoft, 1.50-2.50 Working at Sony Computer Entertainment Europe (Turned into how to pitch your game and break into the industry), then to city hall until 5 to see the line up of companies that arrived at platform. This turned out to be a fantastic plan as we got some extremely helpful information and enjoyed our day, I will now describe each part of our day in the order I described with some video footage I recorded to aid me in some cases. To begin our day we picked up our 18+ Tickets from the platform entrance at around 9.30am ready for the day ahead of us, we then entered city hall to see a massive setup of gaming heaven, the biggest setup of gaming was promoting a game called ACE of SPADES which is described as “mine craft with guns” the set up for this was two big ring sets of computers which all linked on LAN so we could play online versus each other, the brief amount of time I had on this due to the huge swarm of school children wanting a go was pretty average I wasn’t impressed with the game enough to go and buy it; if you did enjoy it though the option to enter a multiplayer “hunger games” style mode was available up on the big stage for all to watch on the big screens. This allowed us to move on to explore the rest of the city hall, it had multiple things up for testing or even purchasing from FIFA 14 Xbox 360 to textbooks for sale on the ins and outs of gaming design/ software. After a walk around we decided to vacate to go to our workshop of character drawing, we left feeling like we hadn’t seen much but this was to be revisited at the end of the day (hopefully with less school students bombing round). Onto our Character Design workshop, we arrived at Hull College to find out not only is it being run by one of our tutors Gareth but that Paul our other tutor had picked up us all free tickets this morning, this frustrated us as we paid for the tickets but it wasn’t going to alter our day. The Character Design workshop really allowed us to engage with our create side as Gareth had some large wallpaper paper spread across multiple tables for a collection of mad designs across the day, to create a multitude of random drawings he had put pieces of paper in a pile and asked us to pick 2, we got rodent and robot. 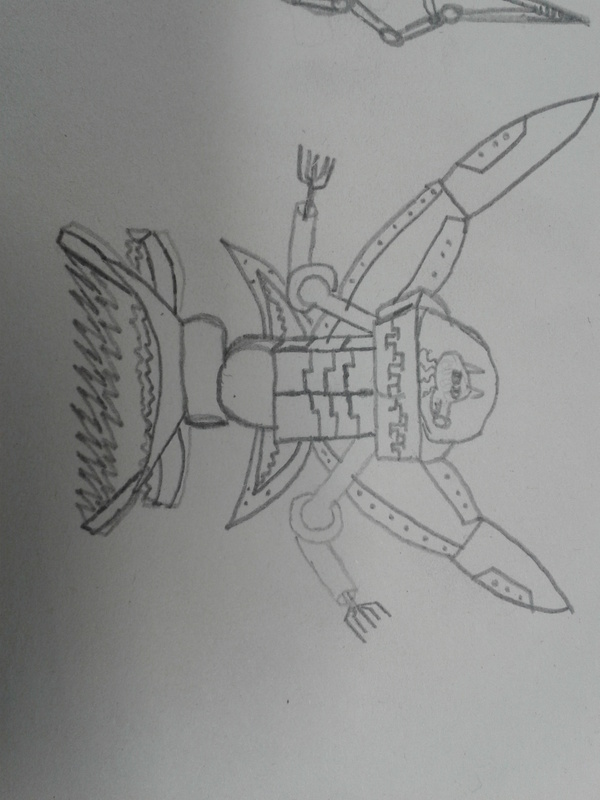 This meant we had to use our own creativity and imagination to try draw a rodent robot, I decided to do my first one which was a mech-bodied rat preserving the head in a cryogenic dome this was a fairly good idea but I had drawn my object in extreme 2d so it didn’t stand out on the page. With that happening I decided to start over with a Mechanical Squirrel (this was determined by pareidolia. See Drawing 101) this was much better as I used contour lines and shading to make my creation stand out which allowed me to add more to the picture like an hydraulic tail. 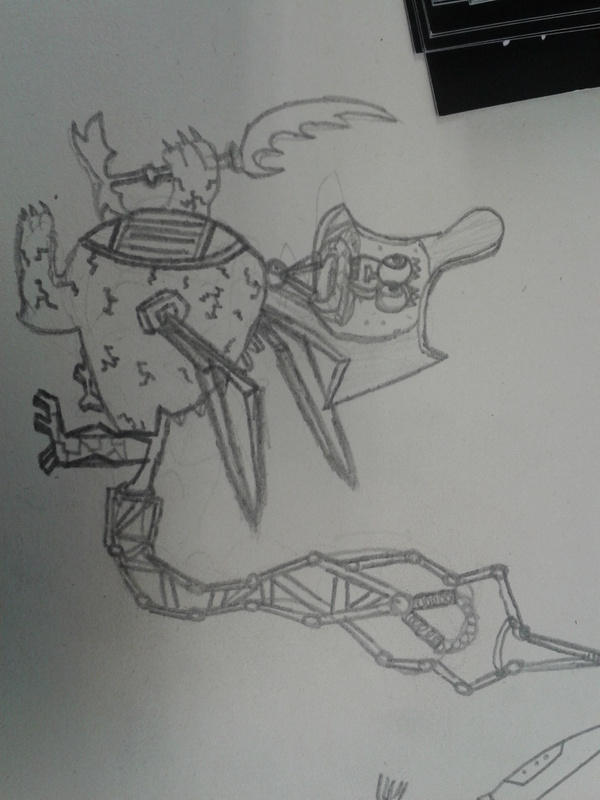 Phil did a rabbit with one mech leg and just a single robot eye no head which was very funny but such a good idea for just a quick sketch, David also did a rabbit but it turned out like a turtle when he tried to separate some layers but still all good valid ideas and efforts at drawing. This concluded out character workshop but it was on all day so we could return if we found a gap for it. Whilst waiting for our Microsoft industry speaker we had the opportunity to test out the client project which the 2nd year games designers are working on built in UDK it was LAN multiplayer which we had a good laugh shooting each other and running around it wasn’t finished but was well on the way. The controls involved the mouse to look around and aim your weapon, then WASD to move up, left, right and back; left click mouse to fire a small bolt of green energy (bullet) and then right click to fire a beam of energy. This gun was called the link gun and I found its concept very good it was well matched with the futuristic style of the characters who looked similar to a halo game. The setting of a burned down Victorian looking place I think was used to contrast the characters who were extremely futuristic so to possibly suggest a alien invasion on this location who are clearly an advanced race fighting over this planet (blue team vs. red team). This game was called Trinity Church as I later found out the reason behind this is that it is based around Hull’s Trinity Church and made to scale but in the appearance of a different era, I imagine this took a lot of research to get the building structures and appearance of the level right but it certainly made me think Victorian setting possibly earlier I don’t have the exact facts on the time period. Once we had done we headed to Ferens Art Gallery which held the talks for Microsoft industry speakers which the industry speakers was the key thing that us as Games Design students had to listen to, we could well be the future of gaming and the more we know now the better understanding and chance we have in the future (as well as needing a good game and team). After the last speaker slightly running over a bit we finally got into the seminar with the speaker Richard Adams speaking a lot about how good Microsoft are to help young and new businesses by working with them to help them build. He then went onto talking about internships mentioning Microsoft is taking 35 interns on next years (something any student would be scrambling to be involved in) an internship would be great for any young Games Designer as it goes on your CV and you will get a hands on experience of working in the gaming industry. So with that in mind to look out for he handed over to his colleague Carla Prada. Carla showed us a PowerPoint presentation which involved the focus around a character she helped design for sesame street as an interactive TV game for children called cooper. Basically she told us everything about her process the bugs, the time, the deadlines, the software, her background of being an animator and to be honest the product was fantastic as a Kinect interactive game which also game us some ideas of what the process of working for a company might be like. 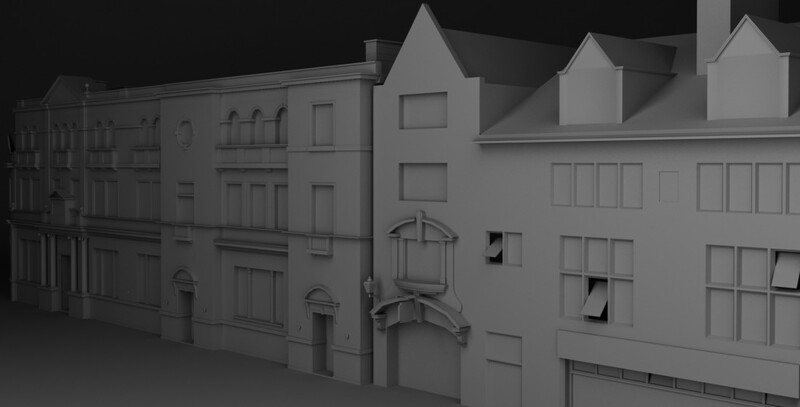 That being said we was expecting from Platforms timetable Developing for Microsoft and working in a Microsoft studio, what we actually got was Microsoft internships/ brief support and a process of a 3d children’s character not particularly what we was expecting but nevertheless valuable to our field of work. In the Q&A after the talk most of the people in the room was trying to get any form of exclusive announcement of Xbox one features before release on 22/11/13 but all he gave us was what we already knew so no surprises there really. This concluded two industry sessions as they sort of just did it altogether. “Your game might get a No, but there is no saying that you and your team wont get a Yes.” -Peter Smith SCEE Sony. This surprised me but also gave me much to aspire to, during the talk he said this and gave us an example of a team of people who didn’t have a good game to start off with to pitch but because Sony saw their passion so much in the pitch for their game they signed them, and that story is the story of the company who made LittleBigPlanet- Media Molecule. The key to remember is a gold painted USB drive to give them, there is a story behind that as the most expensive USB in the word is made of solid gold which he said as a joke is good to give us as a bribe, but if we painted it gold it would have the same effect on him as he suggested it shows we listened and took time to fine polish our pitch off. This rounded off todays industry speakers that we was going to attend and Sony was by far the most impressive as beneficial to us as the possible future of gaming, I can say just from these industry talks I have come out with a bigger understanding on how to get into the gaming industry as a game or a company which is the ultimate goal. Truly buzzing with excitement from all the things we had learned and could do with the information gathered from Sony we headed back to City Hall to the main Platform area. We headed in to see a much less crowded area and a few things we missed, including the prime place we paid to get in for the 18+ area which was down the corridor at the back (lack of signage to find it), this had LAN Gears of War, Call of Duty and GTA V all brutal violent games (right up my street). But once again the console that stole the show in that area was the PlayStation 4, even though it was the same station setup that we had been on previously at the PS4 Social event at GAME it was still irresistible so we had to have another go. 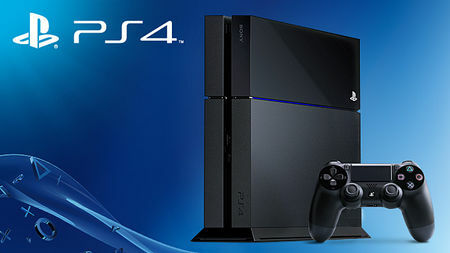 The PlayStation 4 is set for release in the UK on 29th November, I have my pre order sorted have you? if not you definitely should. Again I wanted one even more, and that’s without the like of Killzone: Shadow Fall, Destiny, Battlefield 4, Elder Scrolls Online and many more exciting games and indie games to come that we hadn’t been on yet so all more to come. A master class was given to David at FIFA 14 in two doses first on the ps4 as Real Madrid (see video) and then again a rematch on Xbox 360 as Chunnam Dragons vs. Man United (yes 2star vs. 5star and I still won). This we believed to have brought the day to a close as it was 4.50pm with only 10minutes left of Platform Day 1, but it wasn’t…on the way out we was shown a much anticipated feature in gaming the Oculus Rift device, basically a visor you put over your eyes which makes you see right into the game further immersing you in the game believing you are the character, moving your head and looking around in real life mirrored onto the games character its truly fascinating software, the game was Sandman coming 2014. “The Rift represents the future of gaming- the rift is going to fundamentally change the way you think about entertainment”- GameFront- Oculus Rift. 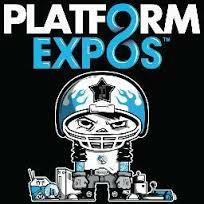 This concluded Day 1 of Platform Expos, yes there is still another day to go of different things. The main focus tomorrow is on indie game designers, we will also see an appearance of Battlefield 4 multiplayer and Assassins Creed: Black Flag Multiplayer in the 18+ section. 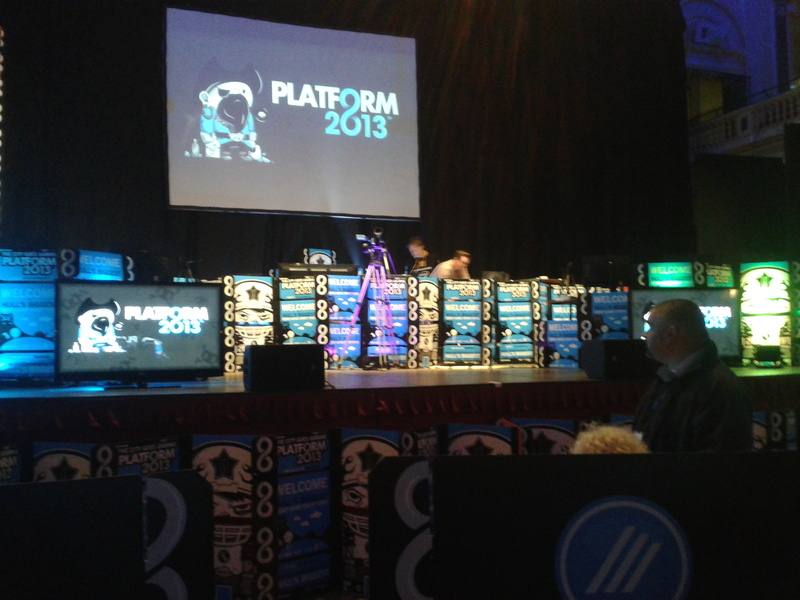 I have thoroughly enjoyed my day and cant wait for day 2 of Platform tomorrow. Categories: Main Blog, Research | Tags: Ferens Art Gallery, Game design, Hull College, Microsoft, Platform Expos, research, Social Event, Sony | Permalink. I and a fellow games design student attended a lockdown at GAME in St. Stephens for one of the most anticipated consoles coming this year, a next generation of gaming console the PlayStation 4. As I had already had the console pre ordered for some time I was very excited to finally get my hands on the console to really see if it lived up to all my expectations from reading multiple psn magazines and latest console rumours. I must say even for the short amount of time I had (roughly 30minutes) due to GAME wanting rotation on the console due to 50people between 12 places on the PS4’s the console was magnificent. The smoothness and clarity of the console and controller was so much of an improvement on any previous console. The controller (which has undergone some radical new changes to become the dual shock 4 from the dual shock 3) was very comfortable in hand and after 5minutes I had got used to it, the new very grippy analogue sticks stopped the previous problem of your thumbs slipping off (usually at a vital moment e.g. hanging off a building on Assassins Creed), the touch pad on the controller something that is completely new to the controller was so smooth to use we tested it on a program which comes with the console called the Playroom. “Its a big step forward from what we have [on ps3]. It feels incredibly accurate and with really high quality materials it feels solid in your hands. There are tweaks to the indentation on the sticks, where you have your thumbs on them- we’ve slightly raised them so there’s more precision. These slight changes make a huge difference. It feels like your in control” – Hermen Hulst- Co founder Guerilla. The playroom used the new camera to help you maximise the controllers capabilities, a futuristic version of air hockey was very entertaining using motion sensors on the control when you tipped it to bend the platform of the air hockey as well as sliding your finger up and down the touch to move your puck and pushing the screen down to add power to your return. I dominated this winning 7-1 but we really enjoyed using the new features on the control, this was only to start with so I could tell this was going to be a leap in games consoles purely on that. I was also pleased to be told that the playroom will be installed onto every ps4 for free. Another thing we tried out was the latest edition to the FIFA series: FIFA 14 on ps4. 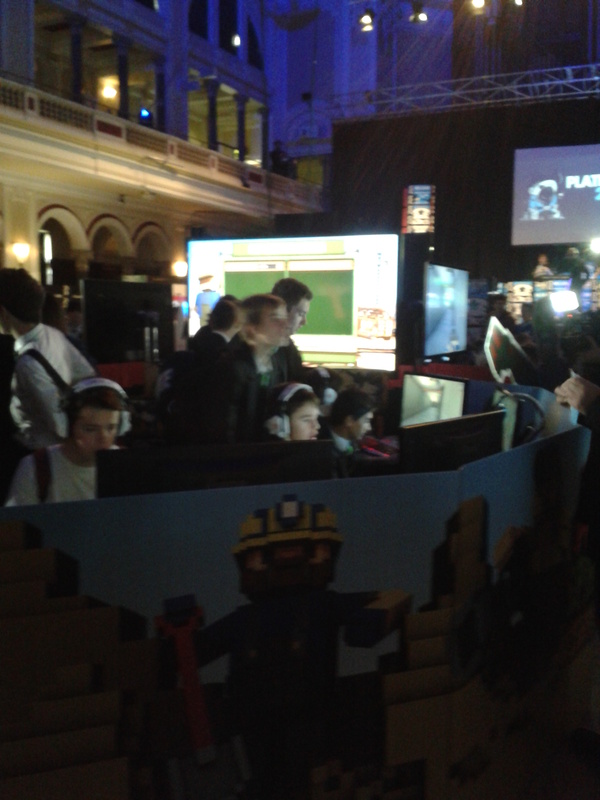 although it was a demo much debate has come up on whether will it be any different to FIFA 14 PS3. Well just from the demo I could see a difference certainly in graphical terms, the clarity of the stadium and its crowd was a much improved on the ps3 version. Whilst much features I didn’t see any difference in (maybe due to it being a demo) I definitely felt once again the controller improved the gameplay for reasons similar to when we played in the Playroom. The new Ignite Engine for EA on next gen will definitely play a huge part in the differences between the ps3 and ps4, most companies had to build new engines to support the ps4’s immense capabilities. The final demo we played was KNACK a new IP for PS4, this was a very impressive game which ran throughout with effortless flow of battle and growth or transform of your character. KNACK has a feel of Ratchet and Clank to it which we both said straight away, especially with smashing the boxes to reveal bolts which magnetized to you. Although with KNACK the blots added to you symbolising health in stature of your character. Another feel of ratchet and clank was when KNACK turned into a small laser proof robot so you can get into small areas and through security this character resembled clank a lot. Despite that the combat was very good and used combinations just like most fighters do with added superpowers when enough crystals had been collected. Overall KNACK was the most enjoyable game that I had tried at the PS4 social event and will definitely be a game I will purchase in the future. “What we’re seeing here is a game that fully utilizes the processing power of the PlayStation 4 system, bringing massive amounts of graphic pieces together to tell a story that’s not just impressive graphically, but in its ability to blur the lines between storyline and gameplay as well.” -Slashgear, Chris Burns. The PlayStation 4 is set for release in the UK on 29th November, I have my pre order sorted have you? if not you definitely should. With just those 3 experiences on PS4 I wanted one even more, and that’s without the like of Killzone: Shadow Fall, Destiny, Battlefield 4, Elder Scrolls Online and many more exciting games and indie games to come. Categories: Events | Tags: DualShock, Event, FIFA, Gameplay, graphics, KNACK, PlayStation, PlayStation 4, research, Social Event, technological advancements, The Playroom, Video game | Permalink.